Second-generation winemaker Chris Figgins honors his family legacy with a return to the first wine his father sold. LIKE HIS FATHER before him, Chris Figgins of Leonetti Cellar crafts some of Washington’s best, most-collectible and most-memorable red wines in Washington. The Walla Walla winery has long focused on Bordeaux varieties, particularly cabernet sauvignon; merlot; and, recently, Italian varieties. It could be argued that Leonetti did more to make Washington red wines famous than any other winery. 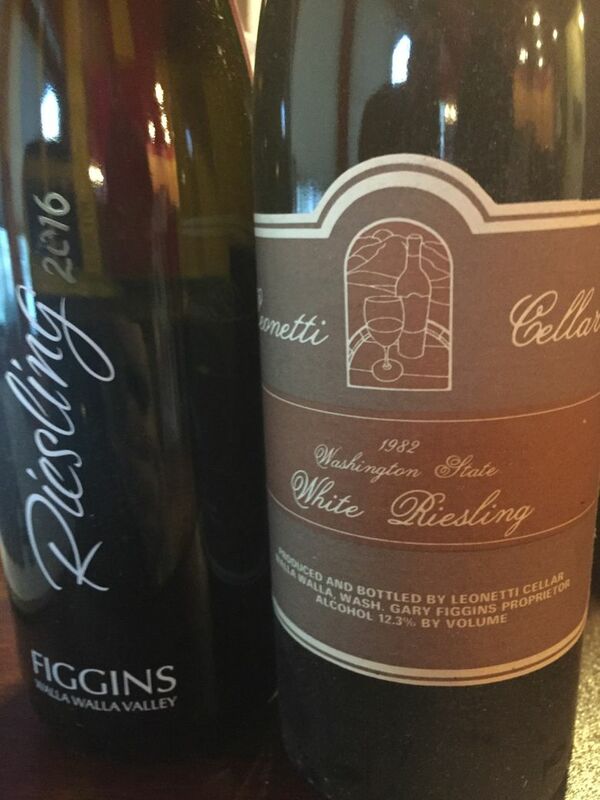 With all of this success, it is often forgotten that when Gary Figgins launched Walla Walla’s first winery in 1978, his first commercial wine was a riesling. This wine is sold through the winery to those on the Figgins mailing list and a few select retailers and wine lists. Instead of a cork, it is topped with a glass Vinolok closure. Figgins Estate 2016 Riesling, $30: Bursting with aromas of fresh-cut apple, ripe pear and tropical fruit, this is backed with bright acidity that helps it pair with Thai, Indian or Vietnamese cuisine. Back then, the state’s focus was on cold-hardy varieties, which is probably why he planted some in his first vineyard. Now Leonetti is back with riesling, although under the Figgins brand. It came about because when Chris Figgins, second-generation winemaker for Leonetti, began planting his new Figgins Estate Vineyard east of town, he was concerned about one area that would be too cool to ripen red grapes. So he did the sensible thing: He planted riesling, a variety he knew would thrive there. He produced his first vintage after the 2011 harvest, bringing in enough grapes to make about 300 cases, all of it sold directly to customers. Being an unabashed riesling fan, I bought some last year. After tasting one bottle, I tucked the rest in my cellar, realizing these were going to age beautifully. In recent years, I’ve become enamored with aged riesling, and the key to knowing whether a particular riesling will age well is its chemistry. I’m not one who normally dives into the chemistry of wine, but in the case of riesling, it is crucial to understand, for example, whether the acidity (often expressed as the pH) will set up a wine for long-term aging, and whether the tension point between fruit, acidity and sweetness will turn into something special in years to come. In the case of the Figgins riesling, the pH always seems to hover around 3. A recent vertical tasting showed the 6-year-old 2011 was nothing short of magnificent, revealing the promise it showed in its youth. Figgins Vineyard is 32 acres, planted primarily to Bordeaux red grapes that end up together in a red wine. Two acres not appropriate for these varieties were smartly planted in riesling. It honors his family legacy with the variety, and gives the younger Figgins an opportunity to scratch the creativity itch that comes with being a winemaker. He uses an old German yeast and allows it to go through a long fermentation, resulting in wines that are delicate and beautifully balanced. The Figgins wines are available only to those on the winery’s mailing list.